Hello all. I have written an ASIO output driver in C++ for low-latency audio playback in my software. The drivers appear to be crashing internally whenever I try to stop/release them, even when I do nothing in response to the callback messages. This takes down my entire application, even though ASIO is running in its own separate thread. I've tried adding lots of Sleep() commands in case the driver couldn't keep up, but to no avail. Can anyone please help me with how to avoid this? I strongly believe they are vendor driver bugs (a driver should never crash, no matter what inputs you give it, it should return error codes instead), however I may well be using the API wrong. Although I've followed host\sample\hostsample.cpp as closely as possible. Other closed-source ASIO applications seem to work okay, but I can't analyze what they're doing differently for obvious reasons. I am using the direct COM interface, since this is a C++ project. drivers which let our software completely crash upon startup. Due to the urgent issues which we had at customers we did a deep dive. 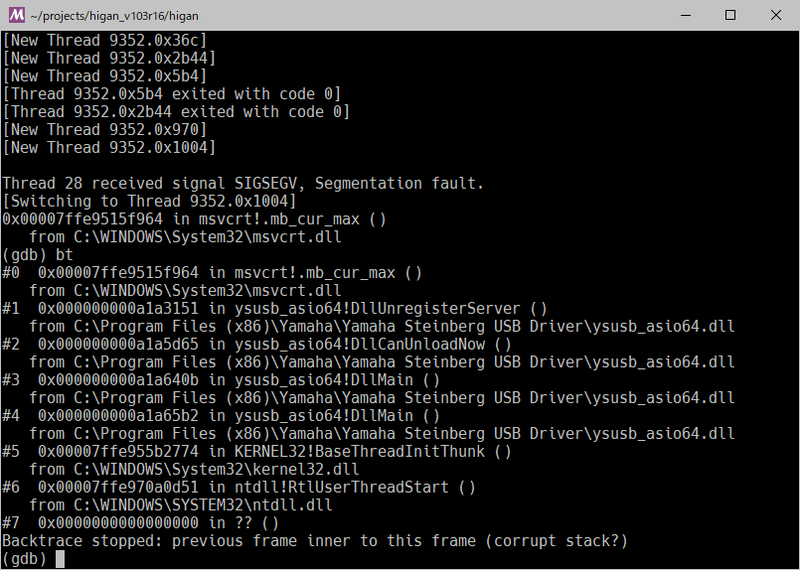 Yes, in case of buggy drivers the ASIO SDK let the complete application crash. The reason is that the ASIO SDK does not contain an exception handling which gracefully handles protection errors. As a result the ASIO SDK software points to addresses into the nowhere. Due to the urgency we had to enhance the ASIO SDK with an exception handling. With that, buggy drivers are handled gracefully and the application skipps those drivers and continues. Since then we had no fault reports anymore for our software. I reported our enhancements to Steinberg immediately in Nov. 2015. However, nobody took action. I even discussed the changes personally with a management member in April 2016 which promised to forward the issue to the right people. Again, no response. After almost one year of attempts to reach the right people I gave up. My conclusion has been that Steinberg has no interests to listen to users and consequently have no interests to maintain and improve the ASIO SDK despite all applications are impacted even Steinberg's own applications. I have documented all our changes in order to show that we comply to the contract agreement. Please understand that I cannot share our enhancement of the ASIO SDK here. This is the job of the Steinberg team to distribute fixes. But I have again touched base to Steinberg to communicate the enhancements now (July 2018). Hopefully, now after almost 3 years after the first notification somebody may listen. May be my response here may help, too. The key issue is that there is no email address available to report issues. Your post in this forum from exactly one year ago (July 2017) shows that this forum is not sufficient to report issues because nobody from Steinberg checks it and takes action.